Only a motorbike festival as big as Rider Mania can attract over 5,000 Royal Enfield riders from across the country to converge in one place. From 12 pm today, the 11th edition of the event will kick off at Vagator, Goa, with a host of competitions, activities, forums and music performances lined up over a period of three days. Among these, the final day promises events like Race Your Buddy and Beer Drinking Mena��to end the carnival on a high note. Checking in from over 10 cities like Bangalore, Chennai, Mumbai, Pune, Delhi, Hyderabad, Kochi and Goa, the event will have solo riders and clubs participating. Around 35 clubs are expected to make a roaring entry, including Chennaia��s Madras Bulls and Thump City Disciples, Delhia��s Soul Thumpers and Royal Mavericks, Bullet Buddhas from Kerala, Royal Pandians from Madurai, Enfield Pirates from Mumbai, and an all-women group from Mumbai and Pune called Bikernia��s. Compared to last year, this edition has more events and competitions. a�?Among the new ones, we have Hula Toss, Race Your Buddy, Carry Your Bike (where a team of four has to carry a bike for a distance of 30 metres),a�? 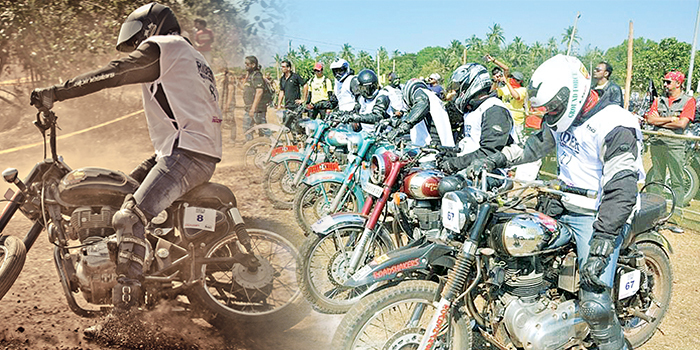 Sachin Chavan, head of Riders and Community of Royal Enfield says , adding that the highlight will be the races (Trials, Dirt and Slow) and the custom bike competitions. a�?More than 15 custom-made motorcycles will be on display on all three days, during which the participants will vote for their peers,a�? Chavan says. There will also be Assembly Wars, a competition where teams of four will try to dismantle and reassemble their machine before riding it to the finish line. Meanwhile, those in no mood to drag their bike through the mud, can impress the judges in the Cleanest Bike contest. Amping the fun factor, riders can cool off with beer drinking competitions and arm wrestling, and exchange ideas in forums and workshops, including photography sessions, and discussions between riders and experts like the Long Distance Travellers Forum. Moving on to the stage performances, we have Chennai-based SKRAT and Mumbai-based Vir Dasa��s Alien Chutney performing on day one. Days two and three witll see Papon & The East India Company (Delhi-based electric folk fusion band), Bangalore-based Swarathma and Nucleya from Ahmedabad. For late comers, the organisers have arranged a gatecrash registration, allowing any Royal Enfield owner access to the event on any day, at Rs1,200.